1. Split data into two parts - 70% Training and 30% Validation. It can be 60/40 or 80/20. 2. Run logistic regression model on training sample. 3. 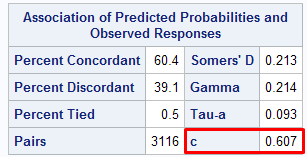 Note coefficients (estimates) of significant variables coming in the model run in Step 2. 5. Calculate Area under Curve (AUC) considering probability scores derived in Step 4. The OUTEST= option in the PROC LOGISTIC stores final estimates in the SAS dataset. In this case, it is stored on the dataset named COEFF. We have run stepwise regression which drops an insignificant variable named GRE. The INEST= option in the PROC LOGISTIC uses the final parameter estimates calculated from training dataset. The MAXITER= option in the MODEL statement specifies the maximum number of iterations to perform. The combination of DATA=validation data, INEST=final estimates from training data, and MAXITER=0 causes PROC LOGISTIC to score, not refit, the validation data. Use only significant variables from the training data in MODEL Statement of PROC LOGISTIC DATA = VALIDATION. In the above example, GRE variable was not included. Parameter Estimates (Coefficients) would remain same produced by both PROC LOGISTIC programs as we are scoring in second PROC LOGISTIC program, not building the model. Ignore warning 'Convergence was not attained in 0 iteration' when running second PROC LOGISTIC statement. The c-statistics is AUC (Area under Curve). In this case, it is 0.607. In this method, we are using Wilcoxon method to calculate AUC of validation sample. First, we are scoring using SCORE statement with VALIDATION sample. The above program returns AUC score of 0.6062. 4 Responses to "SAS : Calculate AUC of Validation Data"
Very interesting this post and the previous of interactions in logistic regression. You can use the following program to generate ROC curve. The OUTROC= option stores sensitivity and (1-specificity) of various points in SAS dataset. Thanks Deepsanshu is helpful your answer.